Currently recommenced work and ready to commence her racing career. An opportunity exists to race an athletic filly by Proven Group 1 stallion Domesday out of a 6 time winning Stakes placed mare Dashalot. 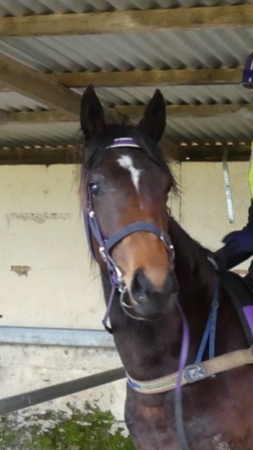 This filly is in work and ready to commence her racing career. All the hard work is done. Advertised price is plus gst. *The seller has agreed that this relinquished share in a private regular ownership group is being offered for sale and does not form part of a managed investment scheme. DOMESDAY (AUS) (Brown 2002-Stud 2006). 2 wins at 2, STC Silver Slipper S., Gr.2. Sire of 446 rnrs, 260 wnrs, 16 SW, inc. Pressday (BRC TJ Smith Classic, Gr.1), Ruthven, Doctor Doom, Arcadia Dream, Daysee Doom, Domesky, Heart Starter, Oregon's Day, Antelucan, Divorces, Royal Symphony, Five to Midnight, Italy, Cailin Miss, Sunset Rock, Backgammon, SP Have Another Glass, Supara, Whatalovelyday, Giresun, Nextanix, Emphasis, Mr Optimistic, etc. DASHALOT, by Dash for Cash. 6 wins-1 at 2-to 1400m, A$112,157, 2d MRC Le Pine Funerals H., 3d MVRC Corporate Interiors Australia H., Sportingbet H., 4th VRC Talindert S., L. This is her first foal. Dashalot. 6 wins. See above. Stashalot. 6 wins from 1100m to 1600m in Aust. Rural Hunter. 3 wins at 1200m, 1300m in Aust. Bayley Birds. 2 wins at 1200m, 1600m in Aust. MAJOR (Zeditave). 5 wins-1 at 2-to 1250m, A$188,085, STC Eskimo Prince H., L, VATC Jack Holt Welter H., AJC Chronicle Welter H., STC 2KY.com.au H., Bookmakers 2YO H., 2d QTC Mercedes-Benz Triple Crown H., L, AJC San Miguel H., STC Western Suburbs Sports Club H., Men of League H., Safilo Eyewear H., Tooheys H., Tooheys Extra Dry H., 3d VRC Standish H., Gr.3, BTC Golden S., L, AJC Provident Capital H., Cordale H., STC Aquaveta H., 4th STC Todman Slipper Trial S., Gr.2. KARACATIS (Hussonet). 11 wins to 1300m, A$646,530, to 2016-17, SAJC DC McKay S., Gr.3, MRC Christmas S., L, SAJC WH Wylie H., L-twice, Adelaide Cup Raceday H., Ubet H., Alf Gard Memorial H., Your Local IGA H., Adelaide Casino H., Myer H., 2d SAJC DC McKay S., Gr.3-twice, Bridges Financial Services H., Schweppes H., Schweppes H., Campolina Stud H., Chris Vella Birthday H., Davo's Buck Show H., Distinctive Homes P., 3d SAJC Spring S., Gr.3, Manihi Classic, L, City of Marion S., L, Durbridge S., L-twice, 4th SAJC Goodwood H., Gr.1, VRC Yellowglen S., Gr.2, SAJC DC McKay S., Gr.3, WH Wylie H., L.
SHAMILLION (Shamardal). Winner at 2, A$81,000, Qld Tatt's RC Australia Post S., L, 2d GCTC Magic Millions National 2YO P.
Gunna Happen. 12 wins from 1300m to 1600m, A$227,185, AJC Star of Florida Welter H., 2d AJC McGrath Estate Agents H., Randwick Betting Auditorium H., 3d AJC Jim Beam H., Kookaburra H.
Goldson. 7 wins to 1500m in Macau, Macau Albion H., Huddersfield H., 2d Macau Auxerre H., Race Horse Owners Association Bowl, 3d Macau Buffalo H., ATV Cup, Bega H., Be My Guest H.
LIGHTINTHENITE (Galileo). 8 wins from 1200m to 2000m, A$629,360, MRC David Jones Cup, Gr.3, Darwin TC Darwin Cup, ATC Keystone Group H., Jacob's Creek Moscato H., Betting Auditorium H., Ascot Club H., 2d Newcastle JC Cameron H., Gr.3, ATC Festival S., L, Darwin Cup, 3d ATC Chelmsford S., Gr.2, Scone Cup, L, ATC Vincents Forensic Accounting H., 4th ATC Epsom H., Gr.1, Brisbane Cup, Gr.2, ATC Ajax S., Gr.2. Discriminate (Marauding). Winner. See above. TORRA BAY (Cape Cross). 5 wins at 1000m, 1200m, R330,975, Greyville Kwazulu-Natal S., L, Clairwood South Coast Hospice H., Greyville 2cana H., Kenilworth Rossgo P., 2d Clairwood Safety Security Services P., Greyville Pomodoro H., Serendipity Tours P., 3d Scottsville PSL Soccer 6 H.